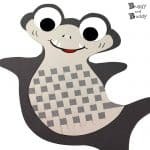 Make a mermaid paper bag puppet using our free mermaid template and a few crafting supplies. 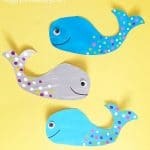 This mermaid craft turns out so cute and is a great way to encourage imaginative play. 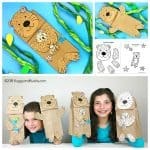 Kids can put on their very own puppet show! We’ve done so many ocean crafts and sea life crafts, but have yet to do a more imaginative ocean craft. So I thought it was time to get fun mermaid activity into our collection! 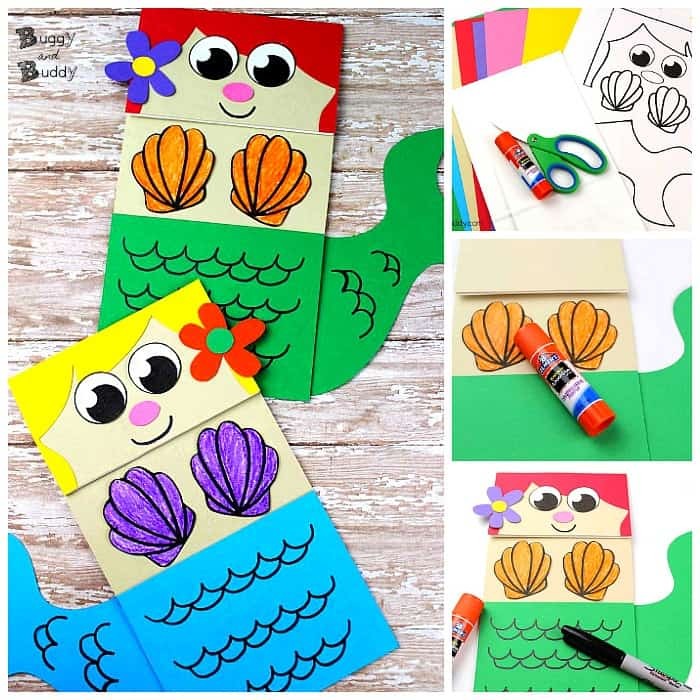 This mermaid paper bag puppet is quick and easy to make and will encourage all kinds of creative play for your little mermaid fan! 1. Print out the free mermaid template. 2. Cut out all the pieces from the template. 3. 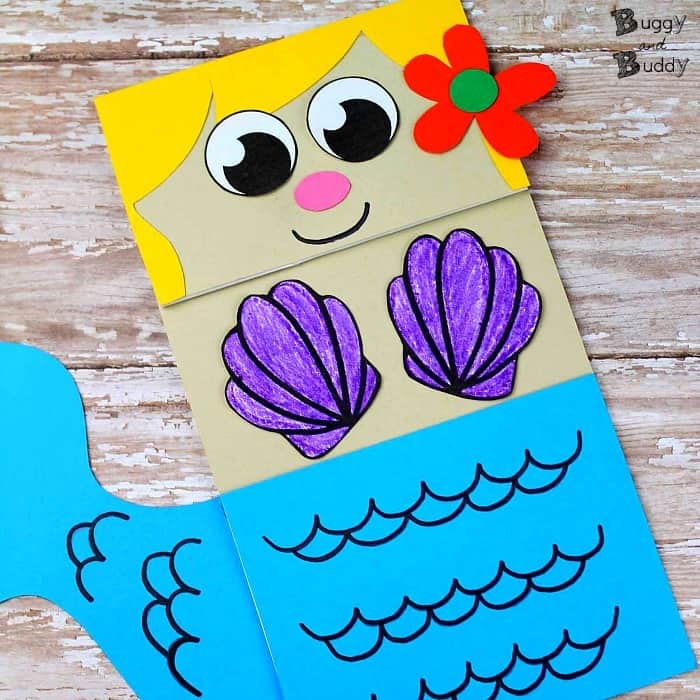 Cut large squares of cardstock or construction paper for the mermaid’s skin and glue them onto the paper bag. Be sure to glue the paper onto the side of the paper bag with the flap. 4. Trim off any excess paper from the sides of your puppet. 5. 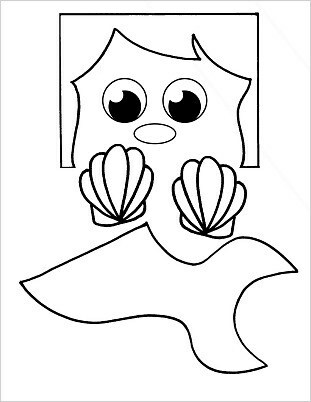 Trace the mermaid’s tail template onto cardstock or construction paper and cut it out. 6. 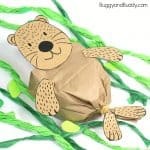 Glue a square of green or blue (or whatever color you want) paper onto the bottom of the paper bag. Trim off any excess paper from your puppet. 7. 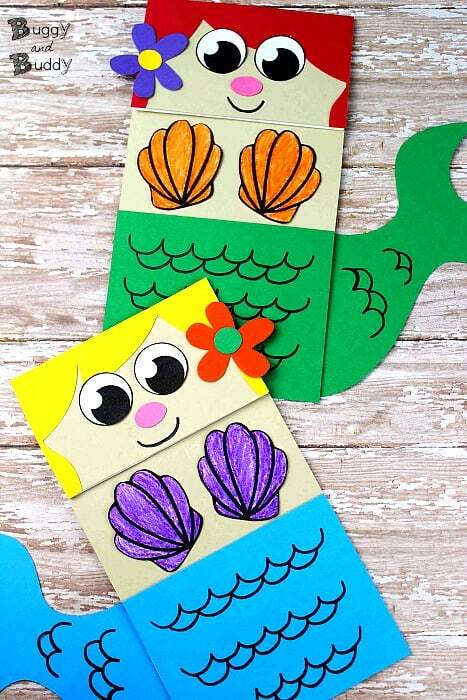 Glue the mermaid tail on the back of the paper bag, aligning it with the colored paper. 8. Color in the seashells. 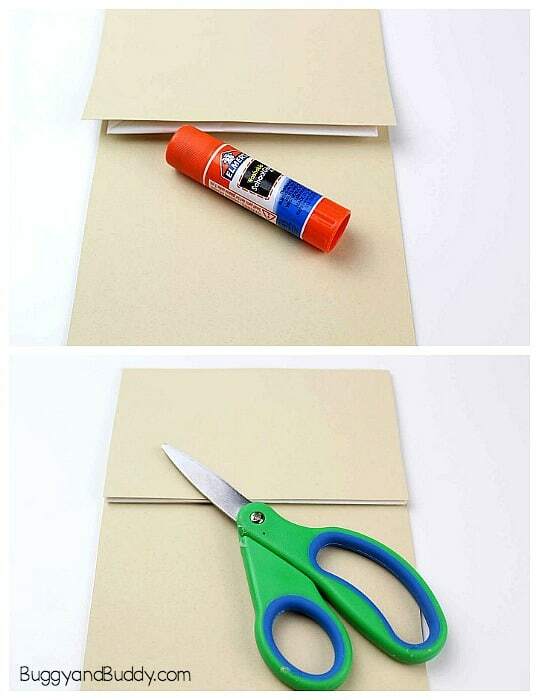 Cut them out and glue them to the front of the paper bag. 9. 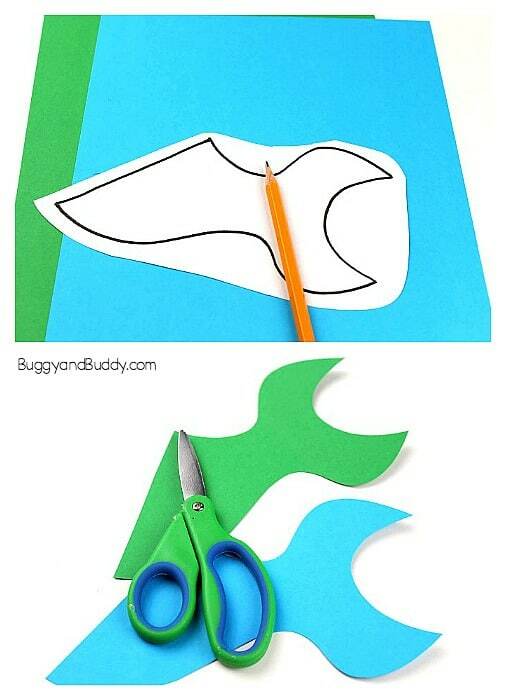 Trace the hair template onto colored paper and cut it out. 10. Glue the hair onto the top of the paper bag. 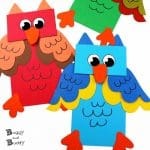 Use scissors to trim off any excess paper from your puppet. 11. 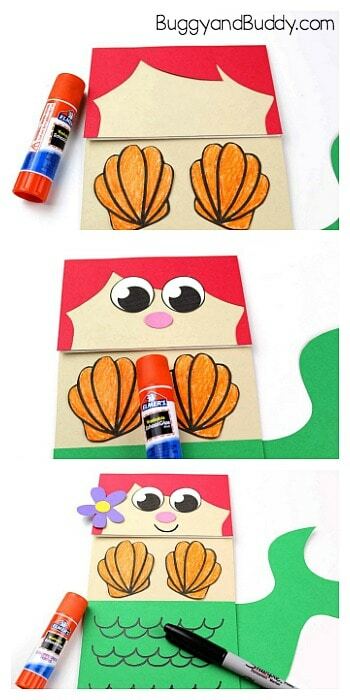 Trace the small oval onto pink paper, cut out and glue onto the center of the mermaid’s face to create a nose. 12. Cut the eyes out and glue onto the mermaid. 13. Use a black marker to add a smile and scale details to the tail. 14. 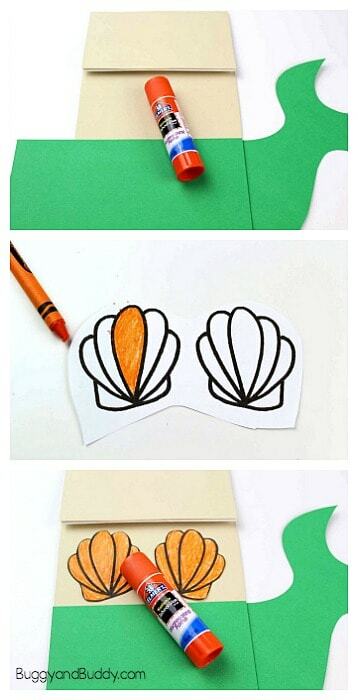 Cut a flower from cardstock or construction paper and glue it onto the mermaid’s hair. 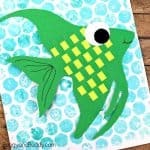 Your mermaid paper bag puppet is finished! 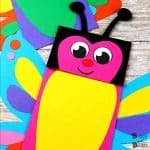 Use it to create your very own puppet show!